Might need the training wheels for this one! When it comes to trains and trainspotting, it’s not something I’m interested in and I only played The Legend of Zelda: Spirit Tracks because it was a Zelda game, and yet here I am reviewing Conduct TOGETHER! and I am awfully pleased I did. Having originally started out as a railing action game developed by Northplay, called “Conduct THIS” and launched on mobile devices, Conduct THIS!, Conduct TOGETHER! is a game that has endured quite the adventure. As Conduct THIS! it went on to become Conduct AR!, only to then be reborn as Conduct DELUXE!, which was reimagined for PC, features all additional content and even had a level editor added. Only, Conduct DELUXE! would go on to mutate even more so. In a statement from the developer, although Conduct TOGETHER! was based on Conduct THIS!, via what was referred to as an “accidental discovery,” Northplay realised just how much more fun the game could be when played with shared controls. So, although it started out as being a single player experience, due to extensive multiplayer testing whilst still in the development stage, Conduct TOGETHER! was born and Northplay went out of their way to remake the game where necessary it was necessary and make it the local co-op friendly title it is now. For the sake of clarity and getting it out of the way, Conduct TOGETHER! can still be played by a single player, so if you’re worried you won’t have anyone to play it with, it’s not an issue. However, if you’re playing on your own and suddenly someone wants to join you, the transition is an easy one because all you have to do is hand them a Joy-Con and away you go. The reason for this is because of the way the controls are set up. The likes of A, B, X and Y are used for controlling controls, whereas the directional buttons on the left Joy-Con are used for controlling the changing of lanes. Therefore, whether you’re playing as one person with both Joy-Con or as two people with a Joy-Con each, the controls are always the same, the only difference is when there is two of you, you can solely focus on that which you are controlling as opposed to trying to keep an eye on absolutely everything. Where the challenge factor comes in, is in the course, hazards and time. On top of knowing when to change lanes so your train will go left instead of right and avoiding collisions with various vehicles, each level has a set amount of time for you to complete it in. Fail to meet the deadline and you will blow up. Hit another train, and you blow up. Collide into a hazard and you blow up. Every time you explode, you will have to start the given level all over again. So, as tempting as it is to try and take it as slowly as you can, caution might be a necessity, but haste is also a requirement. Not only will clearing a level faster better your chances of getting all 3 stars, but should you beat every level in a region with 3 stars, you will also receive a gold medal/trophy that will be added to your awards display in the HQ section of the game. While the stars themselves are not directly needed for unlocking new areas, some areas do require a set amount of trophies, whereas most regions require coins to purchase them. Only, the regions you can purchase do require to in the immediate vicinity of other regions you have already unlocked. As for how to acquire trains, you can do that by completing regions and being given them as a free gift. On a positive note, since Conduct THIS! is a mobile game, it should delight Conduct fans to know that Conduct TOGETHER! does in fact support touch-screen controls. So, while the likes of pressing the A button will cause the train associated with A, to stop and pressing the direction button associated with a specific lane, to change course, you can simply make these changes just by touching the trains and lanes. Something else you can do in Conduct TOGETHER! is trigger a slowdown by pressing the ZR and ZL buttons at the same time. Slowing things down is great for trying to stop your trains in time to avoid disaster, but even though there is no end to how many times you can use it on a given level, you can only use it for so long before the slowdown bar depletes completely. So, when it is empty, you will need to wait for it to recharge. Other than avoiding danger, one benefit to slowing down time is hearing the game’s soundtrack take a slower pace as well. In fact, on some levels (each region has its own distinct piece of music composed by Simon Kölle,) the slowed down tunage can sound even better than at its quickened and intended pace. Now, although I didn’t encounter any noticeable issues, Conduct TOGETHER! does have a patch on its way to correct known issues in the game, but honestly, although Conduct Together! is not my preferred kind of game, it handles great, it is highly enjoyable and I can not think of a single negative. There is a reason why Conduct THIS has 4 million players and it’s because the Conduct games are surprisingly delightful and Together! is no exception. Hands down, Conduct TOGETHER! is a lot more engaging than I expected it to be. 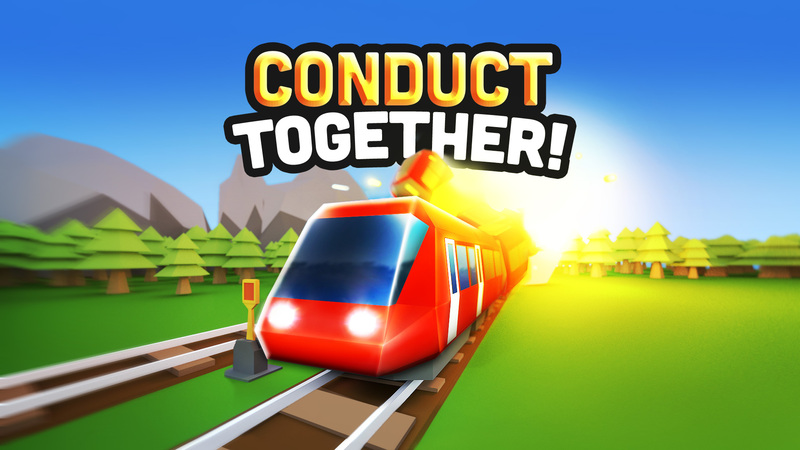 Whether you’re dropping off passengers at their intended stations, or just high tailing it into the rear end of another train, resulting in a large explosion, Conduct TOGETHER! is bundles of fun, whether you’re playing with a friend, or on your own.